In the blink of an eye, the Fourth of July is upon us. It’s the quintessential summer holiday; a time for family and friends to celebrate our independence by gathering on the patio, grilling our favorite foods, and adorning everything in red, white and blue. 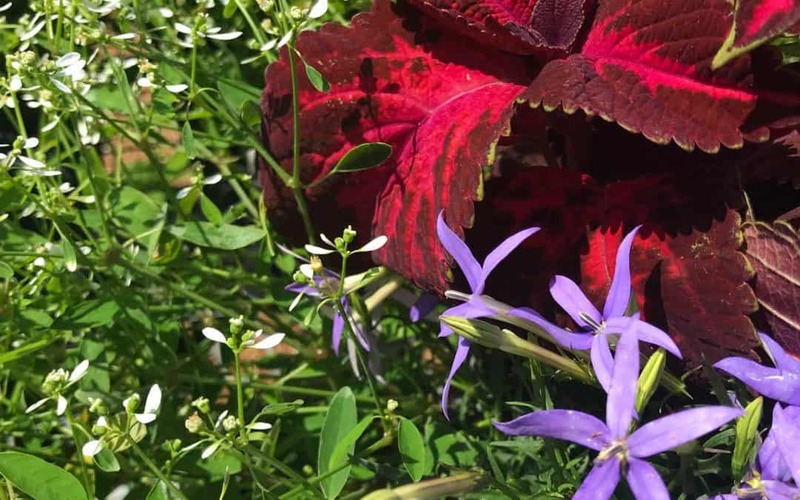 Here are some easy ways to make your patio patriotic for the holiday. We would be remiss if we didn’t put flowers at the top of our list. 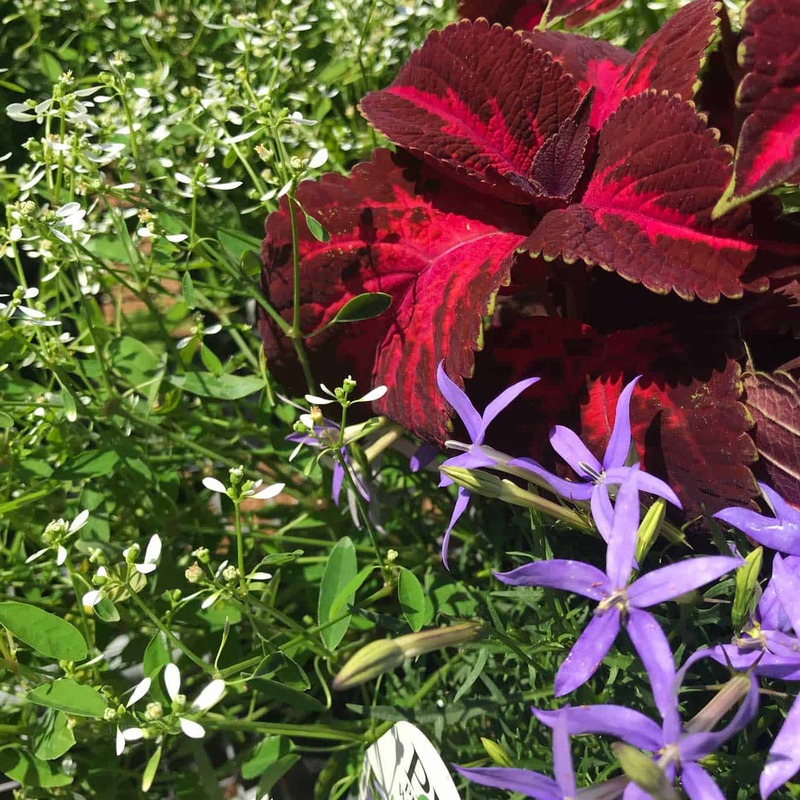 We love Nature’s own stars and stripes and this combination of red coleus, purple star flowers and airy euphorbia is perfect for the holiday. There are many other combinations that would work. Push a grouping of miniature flags into the center of your arrangement just for the holidays. 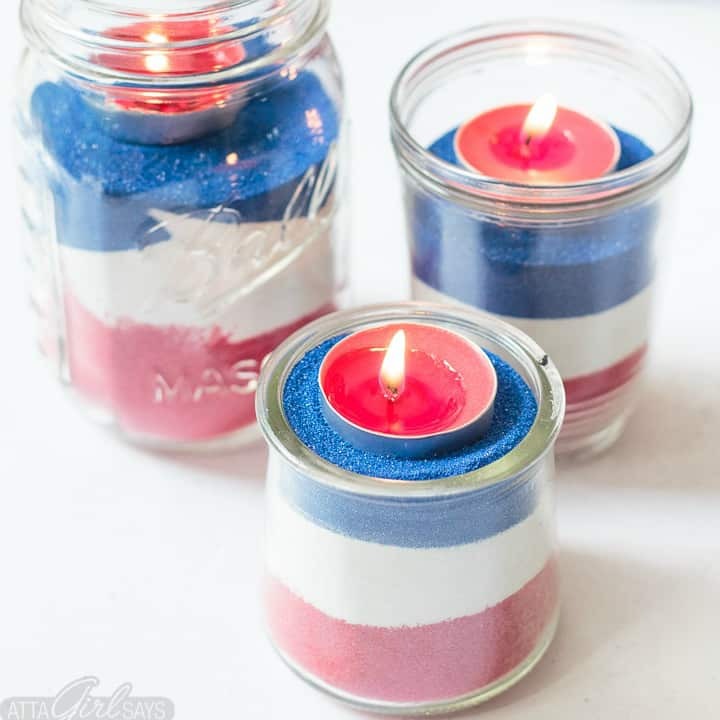 Or wrap your container in red, white and blue bunting and you’re already on your way to welcoming the holiday with spirit. 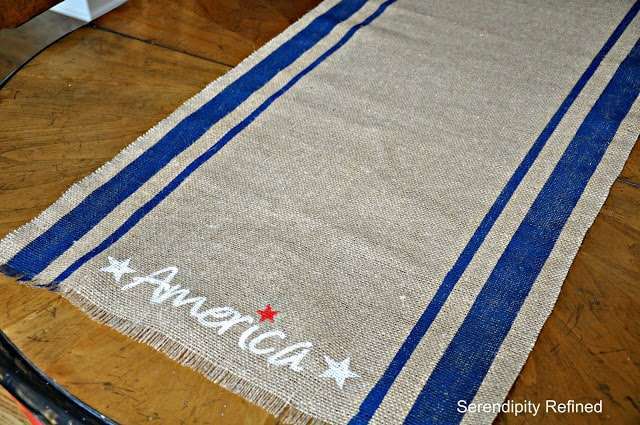 Shannon at Fox Hollow Cottage created a simple table runner with blue stripes and red stars out of burlap and paint. The great thing is you can size this to your table, whether that’s an extra long picnic table for the kids or a round table for 4. We love how she used flags as a centerpiece too. These cute sand art jars from “Atta Girl Says” are super easy to make and the container can be just about any kind of glass jar you can find. You can put tealights or sparklers in them, but we think a large one would also be a great place to safely stash used sparklers so they’re not littering your lawn. 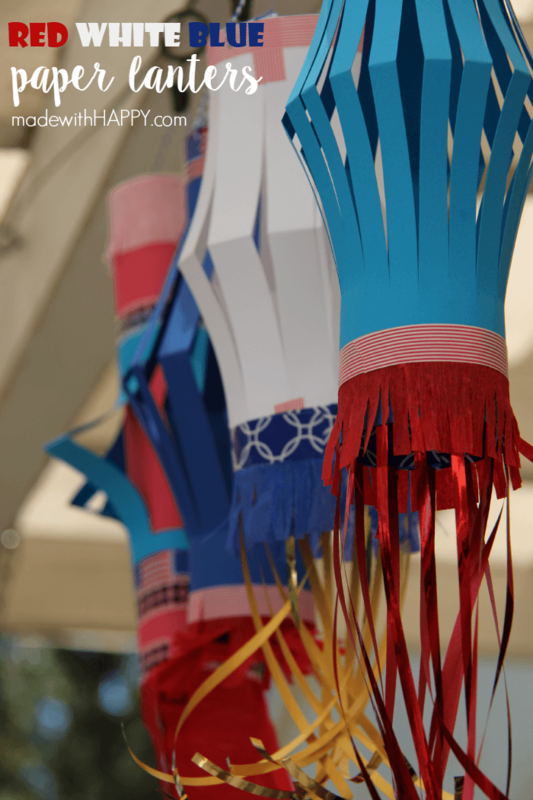 You probably have all you need to make these adorable paper lanterns from madewithHAPPY.COM in your house already. All it takes is a little folding, cutting and taping and these can be flying all weekend on your porch or pergola. You can make this wreath in 20 minutes for about $6 so why not make a few? 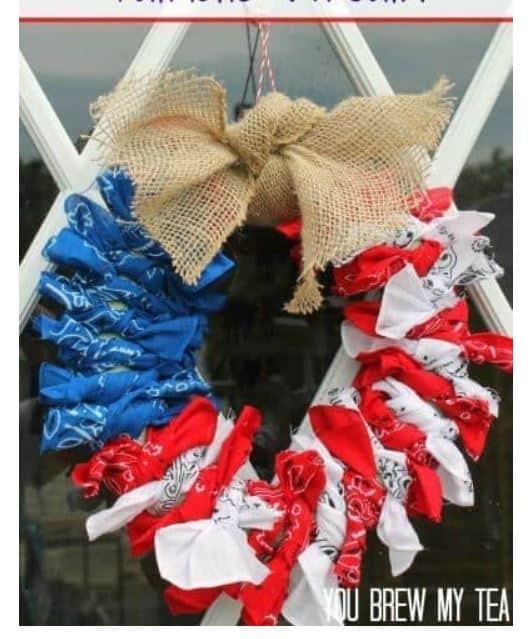 It’s made out of a wreath form from the Dollar Tree, 2 red handkerchiefs, 2 white handkerchiefs, 1 blue handkerchief and a strip of burlap (steal some from the burlap table runner above). Cut the handkerchiefs into strips and then just tie them on. The full tutorial can be found right here. We hope you have a safe and happy 4th!